Get the gang together for the first time in a long time with reunion invitations from Evite. Whether you’re bringing the entire family together for a family reunion or organizing a 5 or 10 year high school reunion, you can keep all the plans in place with our free and Premium digital invitations. Browse dozens of general or seasonal designs around taking trips, meeting for drinks, and more. For high school and college reunions or other large events, try designing your own invitation to give it a personal touch. You can upload a pre-existing graphic, such as a flyer, to our design-your-own invitation templates, or add a logo or photo to an upload-your-own invitation template. 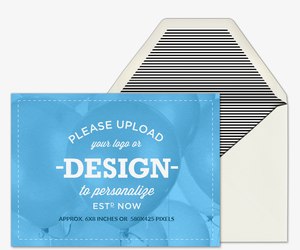 Personalize even further with text, drawings, frames, stickers, and photo effects. 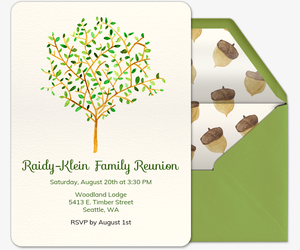 Paperless invitations are the no-stress option for planning reunions. Track RSVPs, manage your guest list, post comments, and send messages all via your invitation page, or on the go with our mobile app. Plus, create custom “What to Bring” lists and polls for guests. Need to reach a large audience? 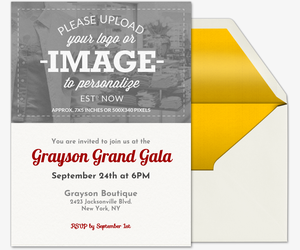 Post your invitation’s custom shareable link on social media, or send it via text. Reunions are all about reliving old memories and making new ones. Encourage guests to upload photos and post comments before, during, and after the event so you can preserve those precious moments in your invitation’s private event feed. Reunions only come around so often, so make this a special one by sending a Premium invitation. 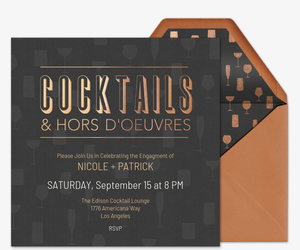 Our Premium invitation experience is ad-free and includes complimentary envelopes, liners, stamps, and photo and text inserts. Pricing is based on the size of your guest list. Check out ideas.evite.com for party planning tips, like recipes, DIYs, and free printables. Been awhile since you last saw your friends? Read up on our helpful etiquette pointers, like What to Do If You Forget Someone’s Name at a Party, or The Dos and Don’ts of Seeing an Ex at a Party. 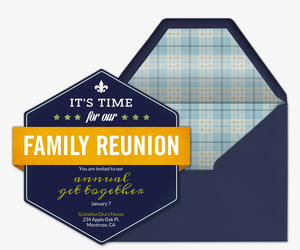 You can find more invitation designs for your reunion in our other collections as well. 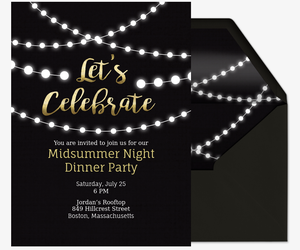 Browse dinner party invitations, cocktail party invitations, family gathering invitations, bbq invitations, or professional event invitations. Got another occasion in mind? Celebrate birthdays, baby showers, weddings, and more with Evite, too.